Located in the heart of London’s East End, Three Colts Lane draws on the creativity of this former industrial area to provide a stylish collection of apartments. Offering shared ownership and Help to Buy London options, Three Colts Lane provides 18 first time buyers the opportunity to purchase a striking, high-spec home in highly sought-after Bethnal Green. Designed by renowned East London design consultancy Studio Morton, the show home reflects the tastes and creativity of ftbs in the area, fusing cool familiarity with high-quality design. 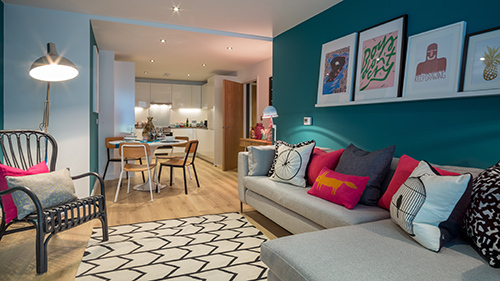 Decorated with affordable furniture from high street brands, bespoke artwork by local artists, and finished with a striking colour scheme, the Three Colts Lane show home embodies modern London living.